Monsters, Inc. is a factory which sends monsters around the world to scare kids who are trying to sleep. It's nothing personal, in fact the screams are used to power Monstropolis where the monsters live. This job isn't easy for the monsters, who believe children are toxic. Sulley (John Goodman), a large woolly blue monster, is one of the company's top scarers. 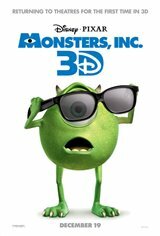 Teamed up with a troublesome green one-eyed monster named Mike Wazowski (Billy Crystal), the two roommates and best friends are finding that today's kids are not as easily scared as they used to be. One night Sulley accidentally lets a young girl named Boo into the monster world. Now Sulley and Mike must risk their own safety as they race to get Boo back into the human world without letting anyone in their dimension know of her existence. With Randall Boggs (Steve Buscemi) sniffing around, it makes it almost impossible to complete their mission.